Let's take a look at the modules page. In Drupal 7 this is called modules, in Drupal 8 I'm going to click manage and then go to extend. At the very top you see a filter by name or description. This is something that used to be supplied by a contributed module called Module Filter. Module Filter still includes some additional tools that Drupal 8 doesn't have, but one of the most useful parts of it was the ability to filter out particular modules by their name or description. 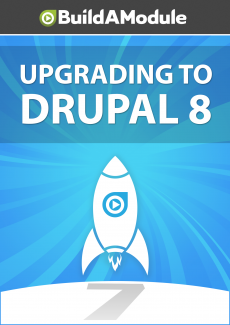 So what we'll do here is go module by module and talk about what's changed between Drupal 7 and Drupal 8. I'm going to expand the Drupal 8 screen a little bit so we get the description here to this side. Now a couple quick things to note about the listing itself, one is that in Drupal 8 it's far more compact. So instead of showing all the operations along with the description it's just the description, and then you can click the dropdown arrow in order to see the operations here.